Cool! yeah I have seen wiked are selling this. But theyr not sadly 100% acurated. Becouse is his first try out. But anyways its a nice beginning! And its a nice canvas if you whant to change it in the future! I was thinking this as my plan B , but sadly i dont have money for it . The fabric is the same as JJ's fabric but not "spun" the same way, but its doublethreaded and coated. The helmet is from the concept art and minor details from the Celebration bucket. After the BS helmet got shown off, some more "theoretical" details have been spotted. But we wont know til after december 16. But with the current CRL its more than approvable. The months after the premiere when "behind the scenes" are released and someone (hopefully) gets unrestricted access to the original, then we can start shooting for 100% accurate. How off can it really be? I mean, the Vanity Fair photos show alot and all of it is consistent with the celebration photos. There might be some layer thing that|s wrong or something on the back, but heck, that's pretty minor and quite possibly an easy fix. Thats the "politics" of the whole deal, according to them their "sources inside disney" claim there is a lot of things missing on the celebration mannequin which in turn is barring any approvals until further notice. *Fangirling intensifies* Can't wait to see it IRL! Looks awsome! See you at premiere... 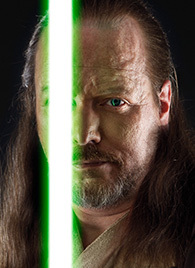 I will be there in my Qui-Gon Jinn costume.